Soon we break out of the dense woods and back into the world of spectacular views in every direction. The immense Ptarmigan Wall lies to the west, a thin ridge of solid rock (an arête created by glacial action) separating the Many Glacier and Belly River valleys and nearly two thousand feet high. The wall merges into the even more immense Continental Divide to the south, right at Iceberg Lake. The lake is in a deep basin (a cirque) which can’t be seen from the trail. To the east are pretty views of Many Glacier Valley. 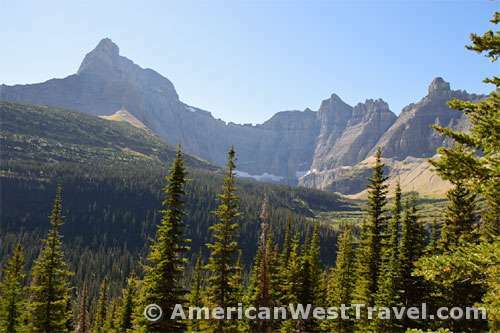 Photo, above left: The mountain peaks of the Continental Divide tower above Iceberg Lake: far left – Mt. Wilbur (9,321 feet) and center-right – Iceberg Peak (9,144 feet). At far right, the Ptarmigan Wall merges into the Continental Divide. Its large prominence is the B-7 Pillar (8,712 feet). The lake itself is in a basin, or cirque, below the snowfield in the center. As the trail turns south towards Iceberg Lake it becomes narrow and uneven with numerous ups and downs. The sun is very warm now; we’re low on water, my feet ache, and it’s late afternoon. So progress is slow and getting slower. Eventually we see some water ahead but it is not Iceberg Lake; it is a temporary and nameless snow-melt lake of a most beautiful aqua color (photo, right). There is yet another rise to climb before reaching the real lake. It does however go through a very beautiful alpine meadow strewn with flowers. Finally, we arrive at Iceberg Lake, and it is indeed an enormous spectacle, so enormous that it is difficult to grasp or capture accurately in a photo. 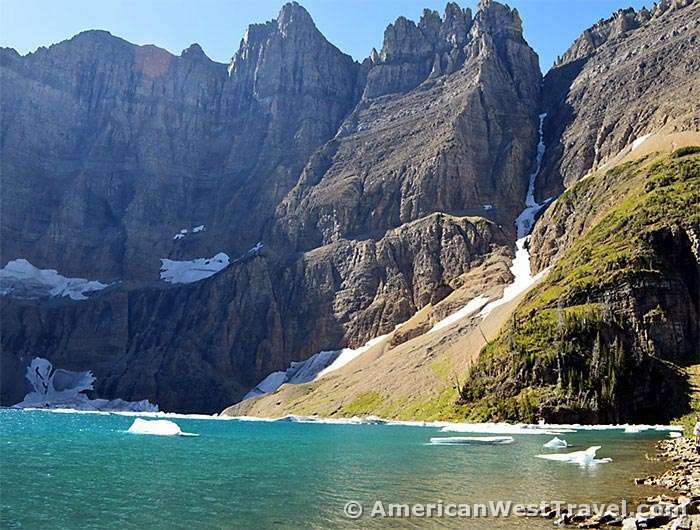 The sheer rock walls of the Continental Divide rise straight up, more than three thousand feet above the lake. The lake is at elevation 6,094 feet. Mt. Wilbur, on the lake’s southeast side is 9,321 feet, and Iceberg Peak on the west side is 9,144 feet. For the urbanites in the audience, that’s nearly the height of two World Trade Centers (height, 1776 feet), one on top of the other. Photo, below: Iceberg Lake with Iceberg Peak (dead center) towering more than 3,000 feet above. The lake is named for the huge blocks of ice and snow that drop off the rock walls during spring melt becoming icebergs. Even now in late summer, there are some icebergs floating around. Being on the north side of the rock wall, the lake gets limited sunshine during the year and is freezing cold. The air around the lake is quite chilly, too. I don’t have the nerve to take off my boots and soak my aching feet in the lake. 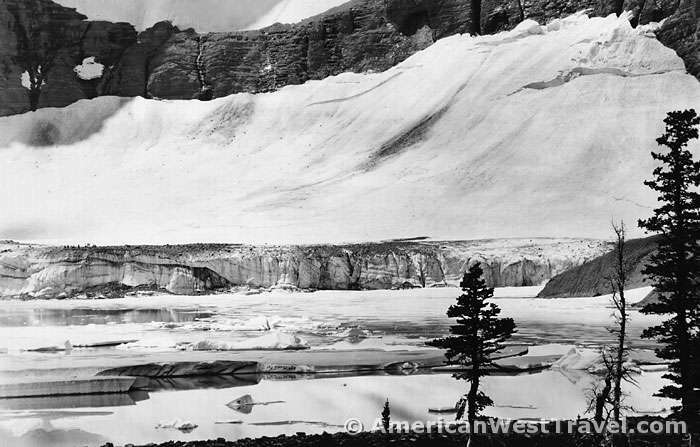 Photo, below: Taken circa 1940, showing the fantastic but now extinct Iceberg Glacier towering about a thousand feet above Iceberg Lake. Note how the leading edge of the glacier seems a good six feet above the level of the lake (and probably extends all the way to the bottom). The lake is choked with icebergs, calved off the glacier. Sadly, most of the park’s glaciers are expected to be gone by 2030. The U.S. Geological Survey estimated about 25 remaining glaciers in 2010 (and estimated there were around 150 a century earlier). This is one of the saddest side effects of global warming. Photo, T.J. Hileman, courtesy of Glacier National Park Archives). Soon there is a second and unexpected spectacle: the Iceberg Ladies don their swimsuits, hop into the lake and swim to the nearest iceberg (see the separate feature story). The last five miles back to the trailhead are downhill but still seem endless. The last of our water is gone. We get back around 6:00PM and head right over to the nearby Swiftcurrent Lodge where there is beer at the grocery store and comfortable chairs on the porch outside the restaurant. The relief of a cold beer and being off my poor feet is enormous. Today’s hike has been the second lifetime-level adventure is a span of three days. I don’t think that has happened before in my 40-year career touring the American West. 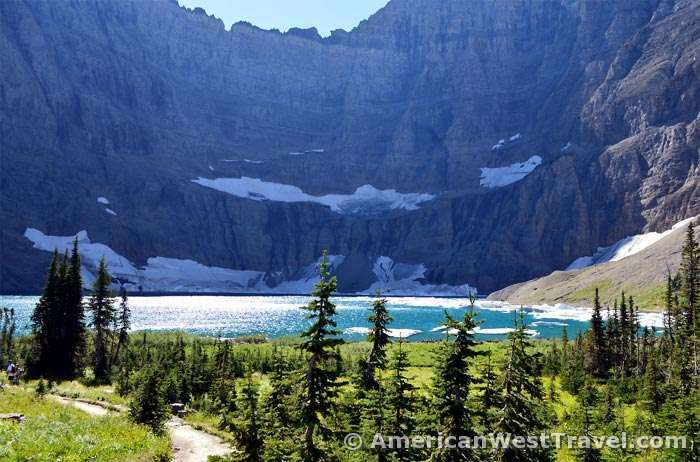 It speaks well of Glacier National Park; that it is indeed one great national park.